This example, which uses a model from Clarke (1987), shows why it is difficult to intuitively reason about the characteristics of the parameters that occur in a nonlinear model. As a consequence, the example demonstrates the indispensability of parameter profiling and confidence curves to identify the nonlinear characteristics of model parameters. The parameter profiling is also augmented with a plot that shows the influence of each observation on the parameter estimates. Furthermore, the BOOTSTRAP statement in PROC NLIN is invoked in order to study the sampling distribution of parameter estimates and make more accurate statistical inferences. By default, the BOOTCI option in the BOOTSTRAP statement adds a column that contains the bias-corrected bootstrap confidence limits to the “Parameter Estimates” table (Output 67.7.1). The BOOTCOV option produces the “Bootstrap Covariance Matrix” table (Output 67.7.1). 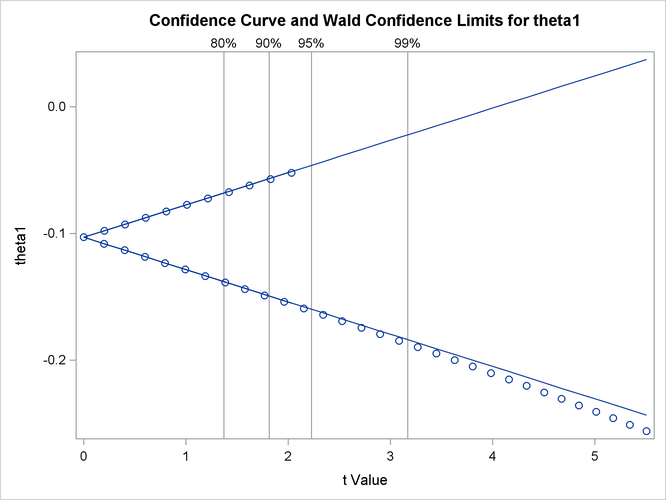 The discrepancy between the Wald-based confidence limits and the bias-corrected bootstrap confidence limits is much greater for than for . The profile t plot, confidence curve, and histograms of the bootstrap estimates show why this is the case. 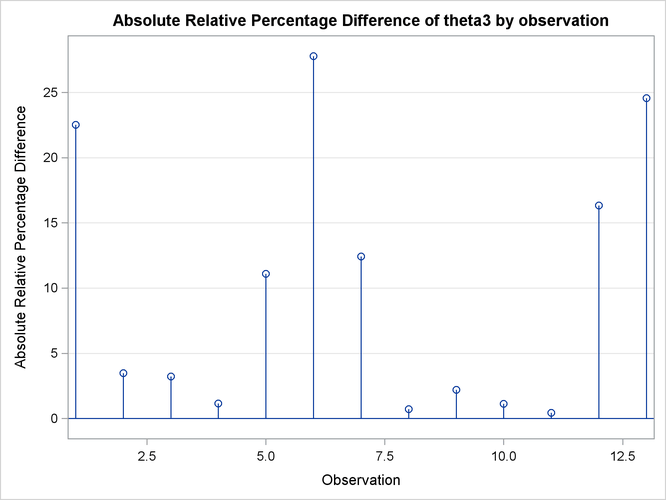 The profile t plot for parameter in Output 67.7.3 shows a definite deviation from the linear reference line that has a slope of 1 and passes through the origin. Hence, Wald-based inference for is not appropriate. 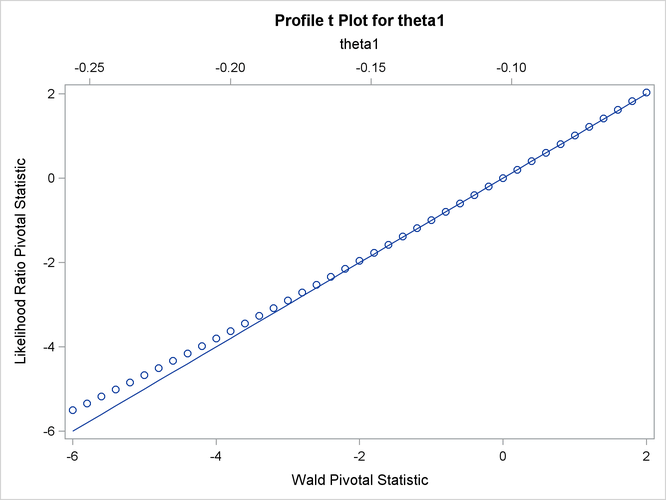 In contrast, the profile t plot for parameter in Output 67.7.2 shows that Wald-based inference for might be sufficient. Output 67.7.4 and Output 67.7.5 show the confidence curves for and , respectively. 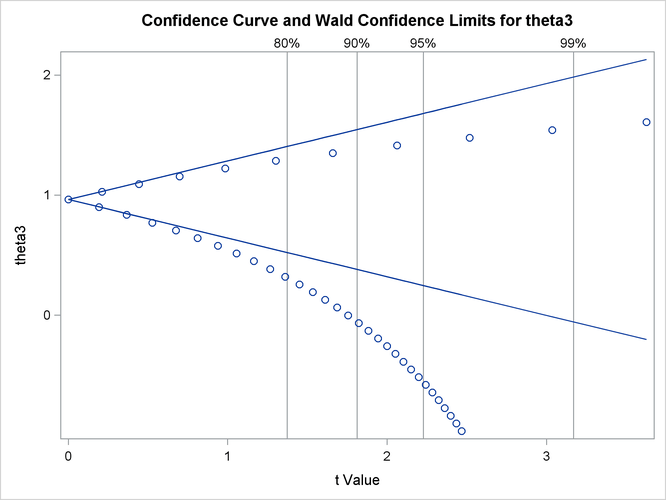 For , you can see a significant difference between the Wald-based confidence interval and the corresponding likelihood-based interval. In such cases, the likelihood-based intervals are preferred because their coverage rate is much closer to the nominal values than the coverage rate of the Wald-based intervals (Donaldson and Schnabel, 1987; Cook and Weisberg, 1990). Output 67.7.6 depicts the influence of each observation on the value of . Observations 6 and 13 have the most influence on the value of this parameter. The plot is generated using the leave-one-out method and should be contrasted with the local influence plot in Output 67.7.7, which is based on assessing the influence of an additive perturbation of the response variable. Output 67.7.8 and Output 67.7.9 are histograms that show the distribution of the bootstrap parameter estimates for and , respectively. These histograms complement the information that is obtained about and from the profile t plots. 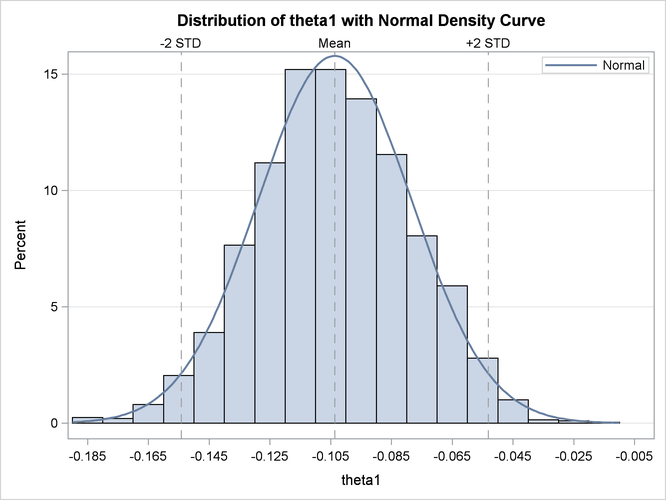 Specifically, they show that the bootstrap parameter estimate of has a distribution close to normal, whereas that of has a distribution that deviates significantly from normal. 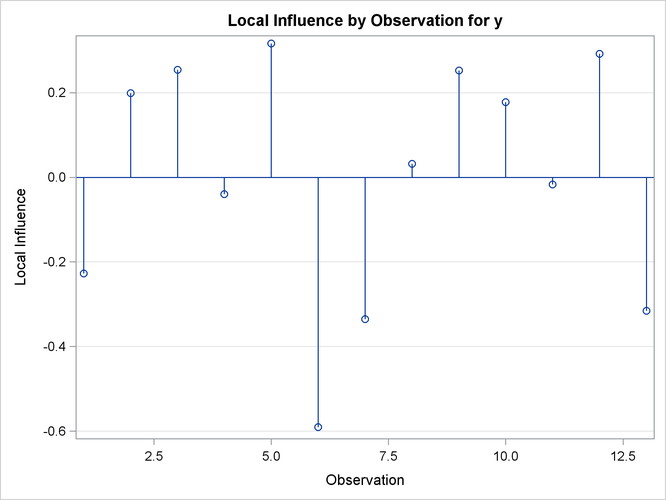 Again, this leads to the conclusion that inferences based on linear approximations, such as Wald-based confidence intervals, work better for than for . Finally, this example shows that the adequacy of a linear approximation with regard to a certain parameter cannot be inferred directly from the model. If it could, then , which enters the model linearly, would have a completely linear behavior, whereas would have a highly nonlinear behavior. 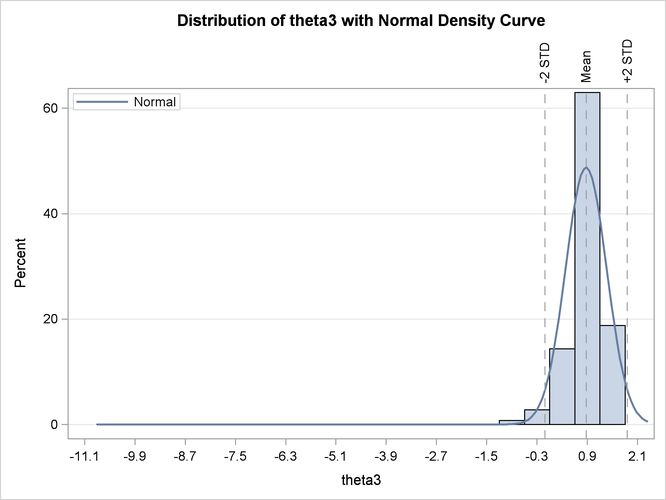 However, the diagnostics that are based on the profile t plot and confidence curves, and the histograms of the bootstrap parameter estimates, show that the opposite holds. For a detailed discussion about this issue, see Cook and Weisberg (1990).